Thanks so much to my friend and Willie Nelson fan Shelly, who sends me stories from seeing Willie Nelson at Charley’s in Pa’ai, on Maui. 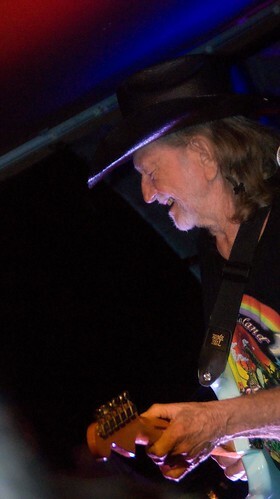 Last year, after coming back to Honolulu from celebrating New Year’s Eve 2010 with a Willie Nelson and family concert on Maui, I regaled my friend Charles Bateman with stories, and made him promise to go with me the next time there was an indication Willie would perform on Maui again. 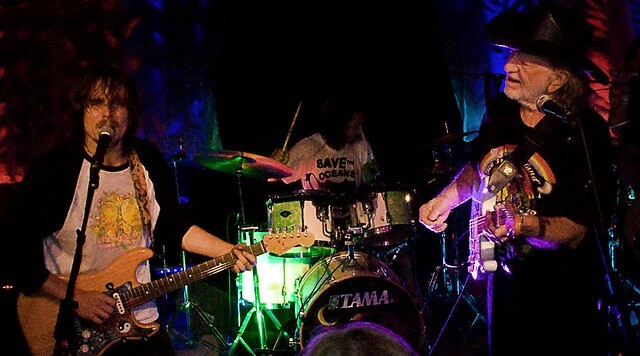 So there were indications Willie might perform with his son, Lukas at one of the two concerts Lukas and Promise of the Real were to give at Charley’s on December 17th and 18th. We took our chances and decided to try for the Saturday nite concert rather than the Friday night one. Once we finally landed in Maui after an excruciating 6 hour delay, we ended up buying the last ticket (single) sold at the bar for the concert. As we went off to eat dinner before the concert, Charles tried to introduce doubt about who was going to use the ticket to get in. I immediately pulled the car over and told Charles that this was not a matter that I would be able to joke about. Silently, I pondered how difficult it would be to get a man as big as Charles out of the vehicle and leave him in the sugar cane field so that this question would be settled for certain. He seemed to get the message and didn’t joke about it again, and we went off to dinner still with some tension between us. At 8pm we, or I should say I, was let into Charleys for the concert. Later, Chuck would have great luck buying a ticket from a scalper for a few extra dollars. Once Chuck was in, I gave him a tour of the place, pointing out all the platinum records, the giant-sized Trigger, and other Willie Nelson memorabilia in the bar. We sidled up to a good location near the stage and readied ourselves for the predictable onslaught of the usually stoned, peace-lovin, and aloha-livin’ Maui folks fighting their way up to be close to the stage for the possibility of seeing Lukas Nelson and a legend. 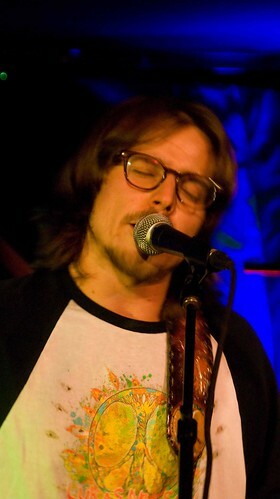 Lukas Nelson and Promise of the Real took the stage some time around 10:45 and played great songs from their new album. Like his father, Lukas has a humble and gracious stage presence that belies his tremendous talents as a musician. Meanwhile, Willie’s other son, Micah began embellishing a surfboard with his unique artistic skills, transforming a typical surfboard into a trippy, mind-bending board. Lukas and his fellow band members, just in their twenties, did a remarkable job playing Willie’s country classics that are decades older than them; “On the Road Again,” “Mammas Don’t Let Your Babies Grow Up to be Cowboys.” Father and son did some impressive dueling guitar work, facing each other, and it appeared Willie purposely flubbed a portion of the duel to make Lukas look like the victorious guitar virtuoso. They both laughed at this display of Willie’s humanity on guitar. Soon the music turned back to Lukas Nelson and Promise of the Real tunes, and Willie sang and played along, lending a real resonance to the songs. Lukas then spoke of the importance and love of family and his parents in his heart-rending song, “Mothers and Fathers”. Annie Nelson, standing on the side of the stage was visibly pleased as was Willie. Both parents seemed equally pleased and proud when Lukas dazzled the crowd, and particularly a group of 4 young women smitten with him, when he showed off his ability to make music with his instrument and his mouth. The girls seemed close to collapsing by the end of this display. Micah finished with his surfboard creation and joined the band, adding a third drummer to the final set of music. The boys threw in a couple of Christmas standards for the season, and then wrapped up the evening with a combination of Willie and Lukas songs somewhere around 1am. The crowd dispersed glowing, and mellowed back to their normal Maui selves. All those who pushed and shoved, spilled drinks on each other, hugged and kissed and said aloha. This entry was posted on Tuesday, December 18th, 2018 at 8:24 pm and is filed under Lukas Nelson, This Day in Willie Nelson History. You can follow any responses to this entry through the RSS 2.0 feed. You can leave a response, or trackback from your own site.